SEAT Comments Off on SEAT at Short Run! 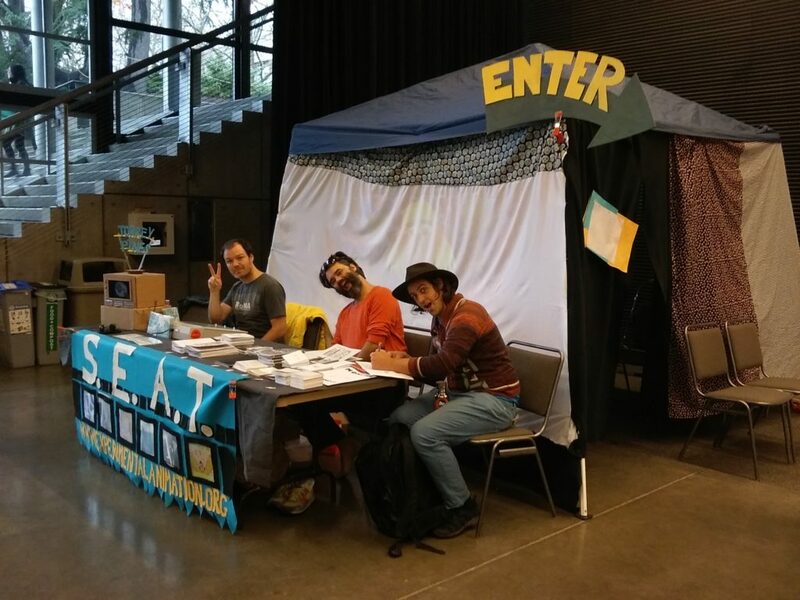 The Seattle Experimental Animation Team was represented at the Short Run Comix & Arts Festival at the Seattle Center on November 5th last month. Animations by Britta Johnson, Chris Looney, Clyde Peterson, Drew Christie, Guinness Waller, James Webber, Nelly Goniodsky, Stefan Gruber, Tess Martin, Webster Crowell, as well as Joe Garber, Aubrey Nehring, Lydia Fu, and Alex Chiu were all displayed inside the SEAT tent, while James Webber, Stefan Gruber and Charlie Daugherty helped man the table, where zines, flipbooks and DVDs were on sale. Awesome fest everybody, ’til next year! 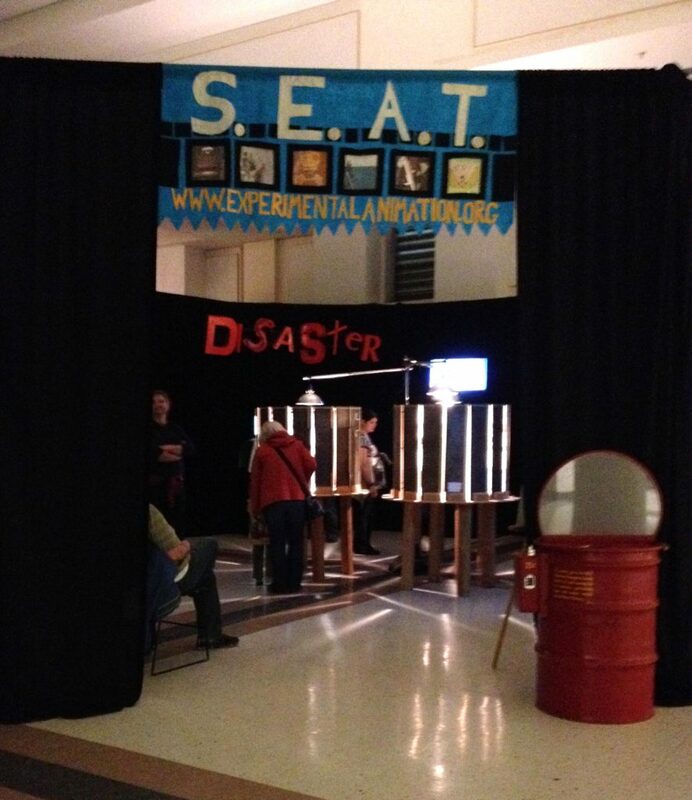 Installations/Screenings, SEAT, SEAT & Spin Gallery4Culture Comments Off on SEAT Zoetropes at Bumbershoot! Come celebrate the re-launch of the Haptic Animation Amplifier website by watching a selection of animated short films from around the world. Curator Tess Martin is visiting from the Netherlands and bringing with her a charming program of animated shorts seen at film festivals, or discovered during her monthly animation discussion event she runs in Rotterdam called Manifest: Animation Show & Tell. On August 8, 7PM, at the Grand Illusion Cinema, she will present the work of her non-profit Haptic Animation Amplifier, show off its revamped website (which now includes profiles on PNW animators, a timeline of animation in our region, and other useful info), and she will introduce you to inspiring independent animated shorts from Poland, Italy, France, Canada, Hungary and more. 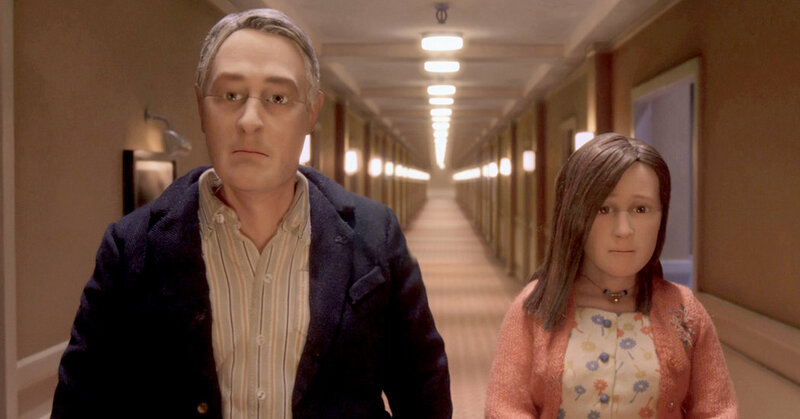 These films are innovative either in their technique, storytelling approach, or artistic point of view. They are sure to generate discussion and inspiration for the animator and animation fan alike. This event is FREE to attend and was supported, in part, by an award from 4Culture. Rendezvous in a bar after the event! 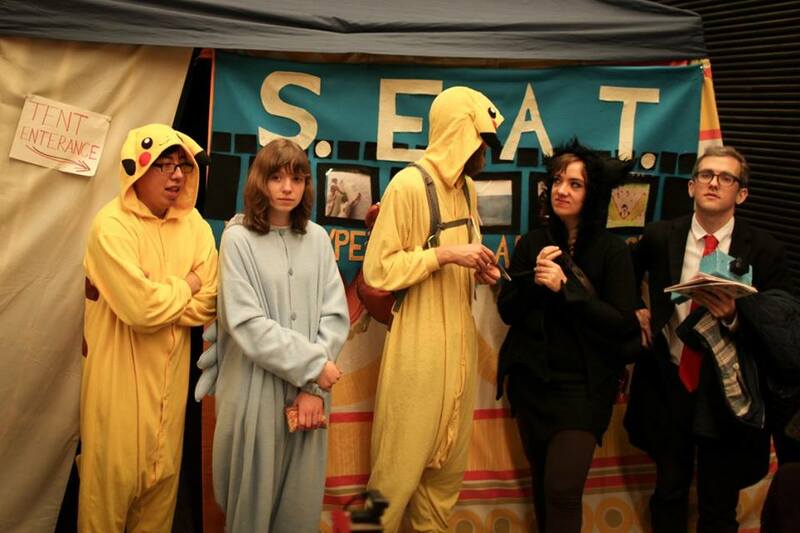 The Seattle Experimental Animation Team was happy to take part in the Short Run Comix & Arts Festival on Halloween in Seattle. We set up a tent, showed films inside and had a great time. Special thanks to James Webber for spearheading this year’s endeavor. Until next year! Setting up the tent. Photo by James Webber. Setting up the table. Photo by James Webber. 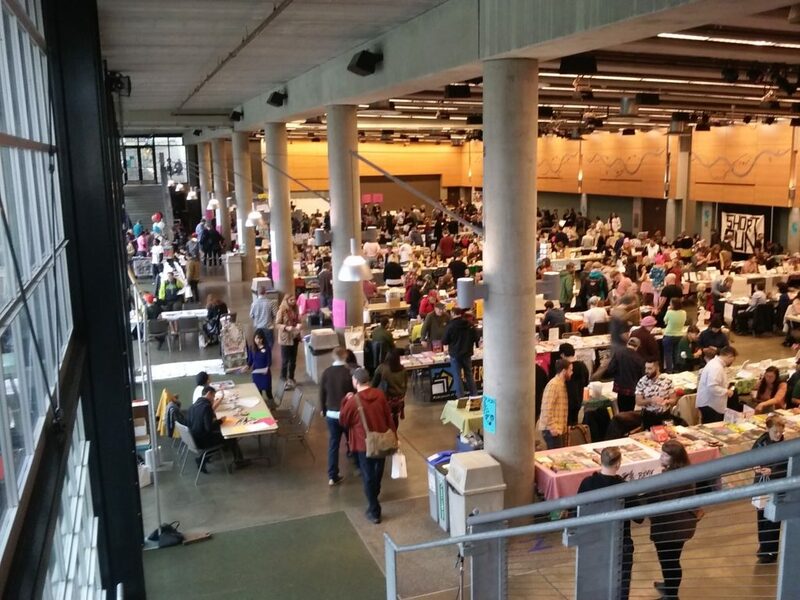 The Short Run hall. Photo by Alex Stonehill/Short Run. Attendees waiting in line. Photo by Alex Stonehill/Short Run. 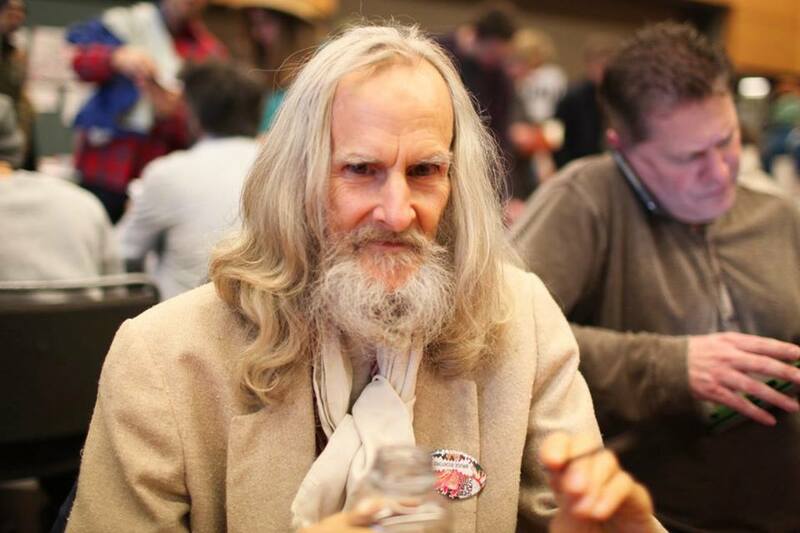 Seattle animator and graphic novelist Bruce Bickford at his table. Photo by Alex Stonehill/Short Run. Comics and animation go together like peanut butter & jelly, am I right or am I right. 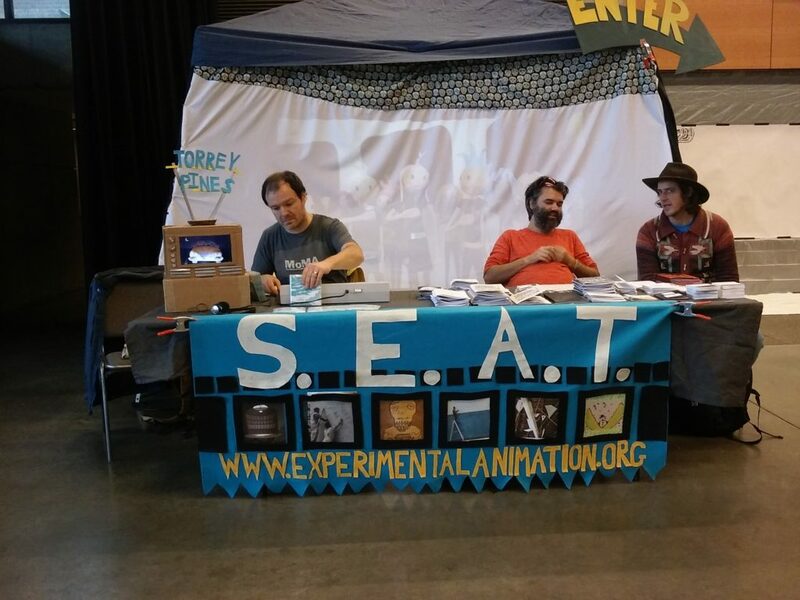 Which is why SEAT has always had an animation tent at the SHORT RUN Comix & Arts Festival. We are going to have a mixture of animations from SEAT members, SHORT RUN exhibitors and an excerpt from Bruce Bickford’s Cas’l, plus Jim Woodring’s 3D slides, about 80 minutes of visual delights! We also have a late additional to the program, a collection of visual poetries called WRIT LARGE curated by FICTILIS, that runs about 30 minutes. Did I mention the festival is free! 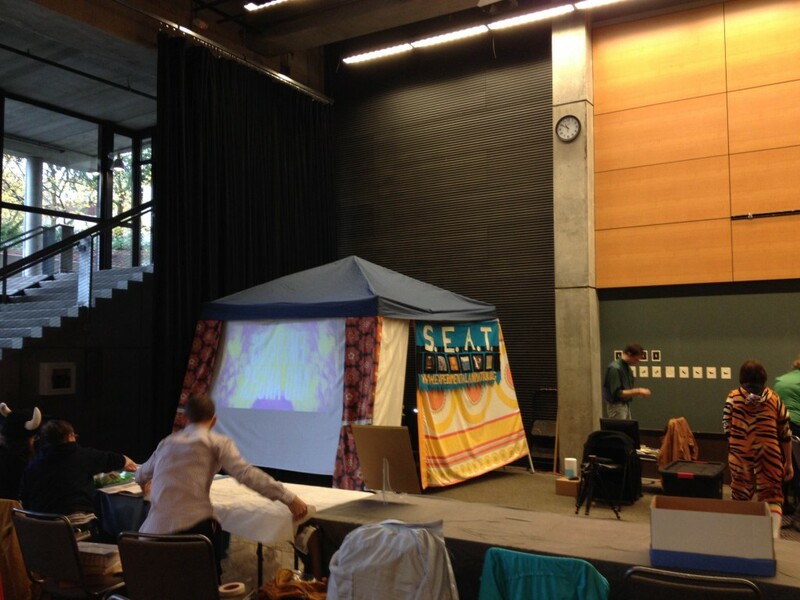 Boundary Crossings is a two-week intensive animation course that happens every summer at the Pacific Northwest College of Art in Portland. 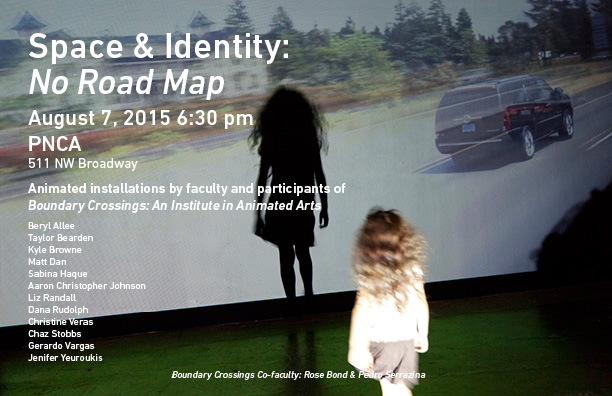 It’s aimed at working professionals and graduate and under-graduate students interested in a hands-on exploration of animated installation as a medium and a site for investigation of moving image interdisciplinary practice. This year’s closing exhibition will be on August 7th, one night only! “Space and time are at the heart of animation. With the proliferation of digital technologies animation expands from the notion of 2-D screen and increasingly impacts public spaces and events – malls, bars, galleries, architecture and live performance. Space can be, as this workshop proposes, a starting point, inspiring a reflection on issues of private and public from the sphere of the personal ideas of place and community. 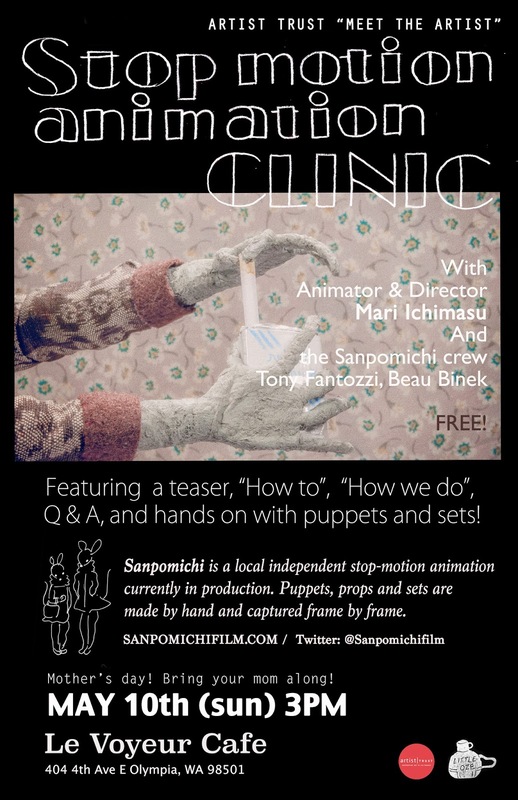 Member Mari Ichimasu and the team from her current stop motion animation project “Sanpomichi” are hosting an event called “Stop-motion animation Clinic” in Olympia on Mother’s day. Bring your mom! They will be showing the teaser trailer for Sanpomichi, give “how to” and “how we do” presentations. 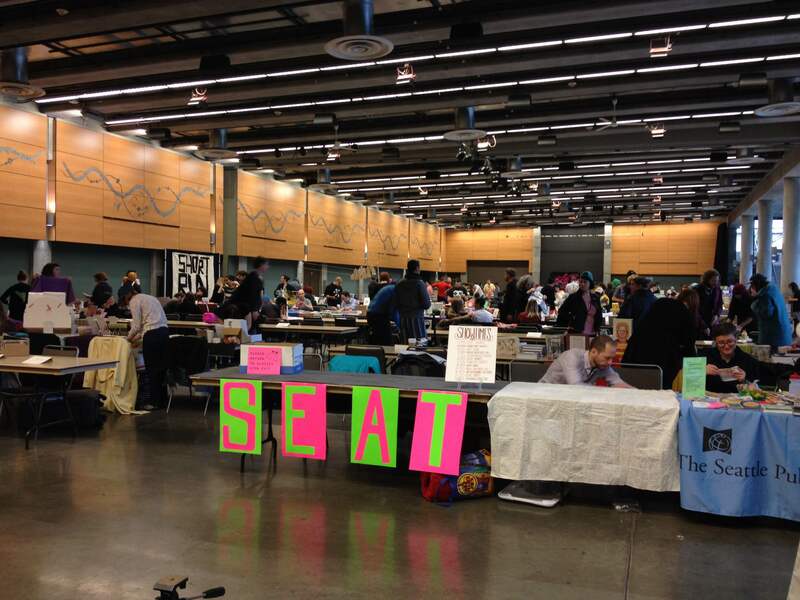 Sets, props and puppets will all be on display for hands on learning. Upcoming animation at the NW Film Forum! Upcoming Comments Off on Upcoming animation at the NW Film Forum! First and foremost is the grandmaster of indie animation himself, Bill Plympton will be visiting and giving a workshop on April 15th called Being An Indie Artist. He will also be screening his newest independently produced feature film Cheatin’ April 15-21. Not to be missed! Cheatin’ Trailer from Bill Plympton on Vimeo. The cinema is also showing The King and the Mocking Bird, a recently re-released French animated feature from 1979. This film has a crazy history akin to Roger Williams’ The Thief and the Cobbler, what with it being started originally in 1947, but not finished for three more decades. This is screening March 19-23. That’s next week! Kelly Sears is a Denver, CO based filmmaker who specializes in collage animation and plays with documentary, recycled cinema and critical fiction. She is giving a workshop on April 19th called Get Up and Stop Down, where participants will help make animated segments that will eventually be combined with the clips made by the workshop in Portland that Kelly is leading on this same trip, resulting in a collaborative film. Sounds cool! A retrospective of her work is also screening that day at 4:30PM. Once It Started It Could Not End Otherwise from Rooftop Films on Vimeo. Also at the Film Forum that might be of interest is the ByDesign program April 10-14, which always has cool films that explore the intersection of design and moving image. Filmmaker Roger Beebe is visiting and giving a Distressed Film Workshop on March 29th which sounds awesome, as well as screening a selection of his Multi-Projector Experiments (on 16MM) on March 28th that sound pretty unique. If you want more 16MM, there is actually a program called Sweet 16 (Millimeter) on April 18th where they are screening rare 16mm films by Seattle filmmakers including our very own Webster Crowell. And finally the Henry Art Gallery is throwing a party called the Arty Party on April 19th that will include a screening of the Best of the Fest of the Children’s Film Festival, which ran at the NW Film Forum in January. This selection includes a number of cool international shorts for kids from Germany, France, Russia, Norway, the Netherlands, Czech Republic and Japan! A very cool selection, and that’s only for March and April! Installations/Screenings, SEAT, Sequestered Together Archer Gallery, Upcoming Comments Off on Sequestered Together opens tomorrow! The Seattle Experimental Animation Team has been working really hard that last few days on our new gallery show at the Archer Gallery in Clark College in Vancouver, WA, outside Portland, OR. 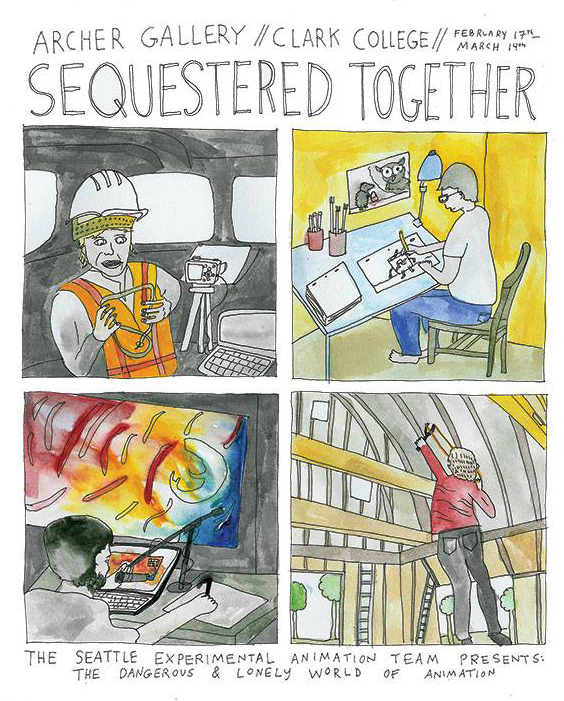 The show is called Sequestered Together: The Dangerous and Lonely World of Animation and the opening is tomorrow, February 17th! 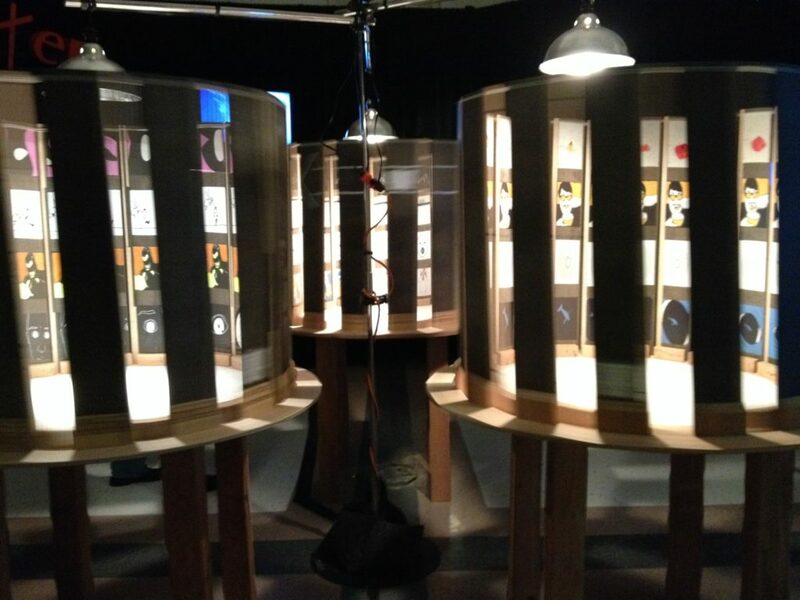 The show is an elaborate collection of short films, music videos, giant spinnable zoetropes and making-of detritus (still frames from drawn animations, puppets, sketches, etc.) from Seattle animators. Represented animators are: Clyde Petersen, Stefan Gruber, Britta Johnson, Webster Crowell, Neely Goniodsky, Ian Obermuller, Devin Ensz, Komari Ichimasu, Joe Garber, Salise Hughes, Sarah Jane Lapp, Chris Looney and Tess Martin. The opening is Tuesday, February 17th, 5PM-8PM and at 5:30PM a guided walk by some of the animators will take place. The show is up until March 14th! Here is the Facebook event. 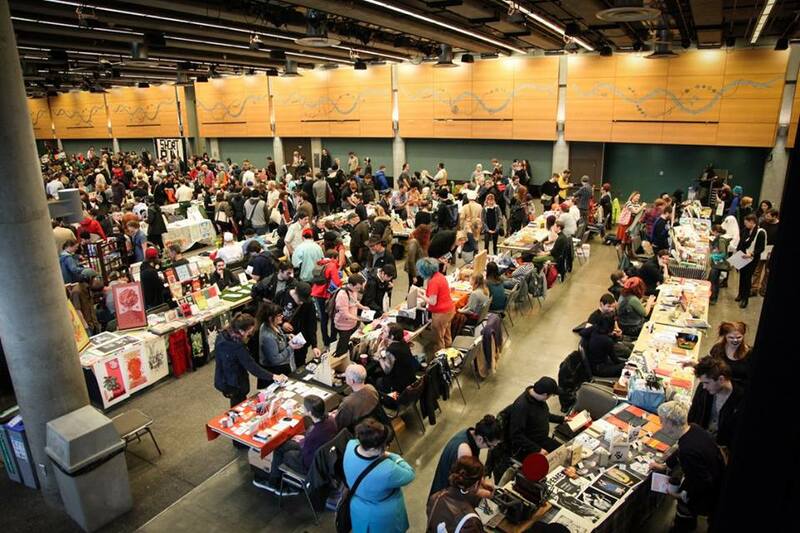 What a great opportunity for the Portland area animators to mingle with the Seattle animators! And check out this post from the Phoenix, the Clark College Literary & Art Journal, about the show.